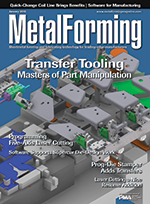 Here's a brief history lesson tracing the move from mechanical to pneumatic to electric actuators to manipulate parts within transfer tooling, and the added flexibility the technology affords to creative metalformers. Traditionally a progressive-die automotive stamper, Pax Machine Works finds that transfer capabilities improve its ability to take on larger and more complex jobs, and to form higher-strength materials. No-quotes? They're fewer and farther between than ever. That's one reason why Cleveland, OH-area metalformer Automation Tool & Die (ATD) opted for complete automation when it invested in a new coil line. Replete with all the bells and whistles, the line is a perfect mate for ATD's new 330-ton servo press. No company feels the pain of shrinking lead times more than prototype shops. Case in point: Accu-Rite Industries, where the adoption of high-speed 3D laser-cutting technology paired with CAD/CAM programming software represent clear success triggers. With lot sizes continuing to shrink and customers looking for a full spectrum of metalforming and fabricating services, the decision became clear: invest in a 5-kW automated laser-cutting machine. There's a new software package in the house at die designer and developer extraordinaire Fontana Pietro, reinforcing the firms mission to support the development of several of the world's "supercar" brands. For an investment in equipment, technology or skill to be worthwhile, it must provide significant value to existing or new customers; meet an existing or potential market need; and hold significant margin potential.